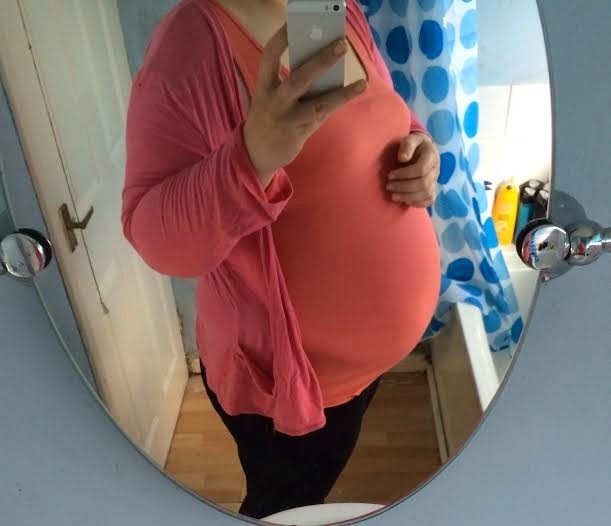 I am now almost 24 weeks pregnant and realised that I have not done a pregnancy update for a while now so I thought I would do a quick update on what week's 21 and 22 were like. As I mentioned in my last pregnancy post I now only have to have appointments with the midwife every two weeks instead of weekly, to check my blood pressure as I am on blood pressure medication as I am at risk of pre-eclampsia. So I went to see the midwife when I was 22 week's and everything was fine with my blood pressure and urine and we got to hear baby's heartbeat which was perfect. The midwife said that baby feels very big for 22 week's though and there was me thinking my bump was tiny, I just know I am going to have a 10lb baby this time. My bump is defiantly more noticeable now, some days I think my bump is huge and some days it looks quiet small. I think it just depends on what clothes I am wearing. Talking of clothes I finally got around to going maternity clothes shopping and I now have lots of lovely maternity outfits mostly from New Look as the maternity clothes are lovely, they do not look at all frumpy as so many maternity clothes do and they are very affordable. I also got a few things from Primark too, it's great that they now do maternity clothes as they are so cheap as like many people I don't want to spend a fortune on maternity clothes when I am only going to be wearing them for a few months. We still have not brought anything for baby yet I think we are going to wait until after Sophia's birthday at the end of the month and then start baby shopping. We still need to pick a name too we have a boys name picked but we can't agree on a girls name and I have a feeling baby is going to be another girl. Baby is moving loads now I feel movements all the time especially when I am in bed trying to go to sleep but all the movements are still really, really low down and sometimes you can see my tummy move when the baby kicks. I am still feeling pretty amazing with lots of energy. I am eating normal and have not gone off anything and I don't have any cravings any more. I have been snacking a lot and having a few small meals rather then big meals lately, as when it gets to tea time I find that I am just not hungry at all. Baby does not seem to like takeaways though as we had a Chinese last week and as soon as I ate it I was being sick non-stop for an hour. I am still having really vivid dreams on a night time and I still wake up during the night and find it hard to get back to sleep. I am waking up early in the mornings, I can't seem to sleep past 7am even when I get the rare chance to have a lie in. I still have lovely smooth skin and shiny hair which I am very happy about but I think I am starting to get the pregnancy mask some women get. I had it in my last pregnancy, it looked like I had loads of freckles around my eyes and nose but they disappeared soon after Sophia was born and it has started again around my eyes. I have also started to get sciatica again which makes walking and standing up quiet painful and difficult at times, thankfully it doesn't seem to be as bad as it was last time. I think I am also starting to get the start of spd again which I also suffered from in my last pregnancy. It is so painful to walk and to roll over in bed, I have started sleeping with my pregnancy pillow to try and see if that helps as I just feel so stiff and sore a lot of the time. I'm just hoping it does not get too bad this time around that I end up on crutches. I have also been suffering from sore arms they just feel like a dead weight and ache and I keep getting pins and needles and I also get really bad cramps in my calf's and in my feet they are agony and wake me during the night and last for ages. A few people have recommended massaging the area, foot sprays and keeping my feet up, so I have been trying theses to see if they help. I am also suffering from massive baby brain lately too I am so forgetful I keep forgetting to take my medication for my blood pressure and I keep repeating myself or forgetting to do things and it is so frustrating and annoying. Apart from all that though I am still feeling pretty great and I am still finding it hard to believe I am actually pregnant and so far this is still my easiest pregnancy so far. Its really nice to read other peoples pregnancy updates! Good luck with the pregnancy!